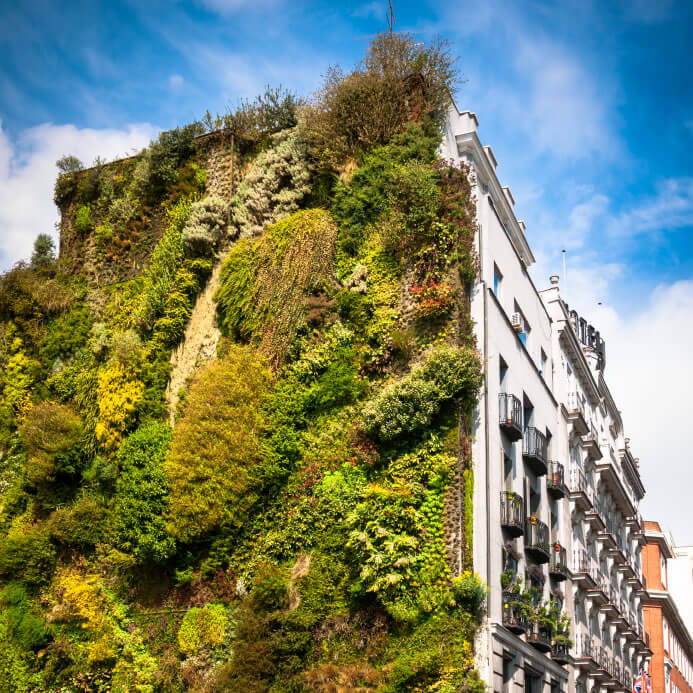 Welcome to our gallery featuring 50 awesome vertical gardens. 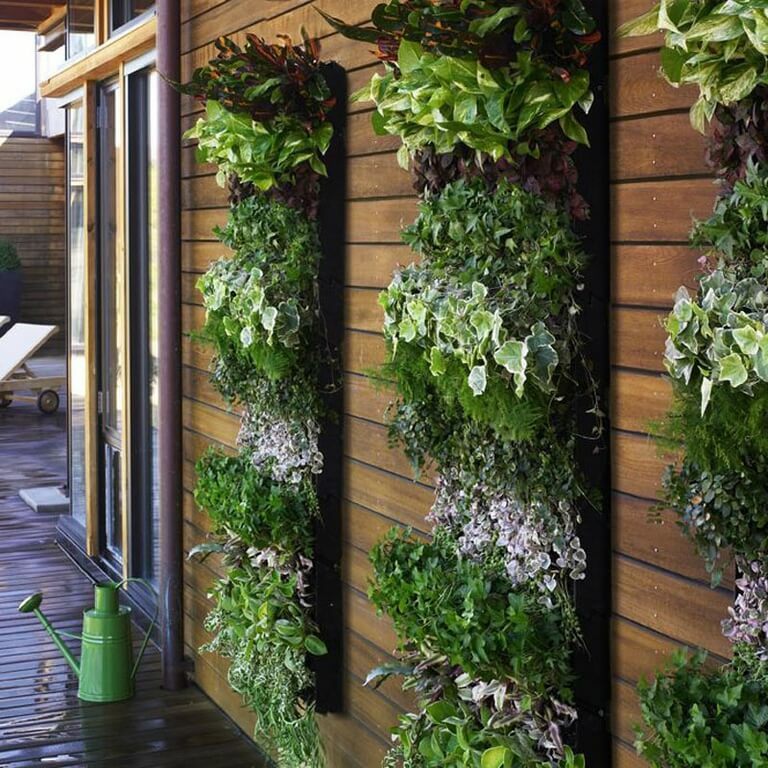 Vertical gardens make great use of space, and they help turn areas heretofore devoid of life into thriving grow bonanzas! 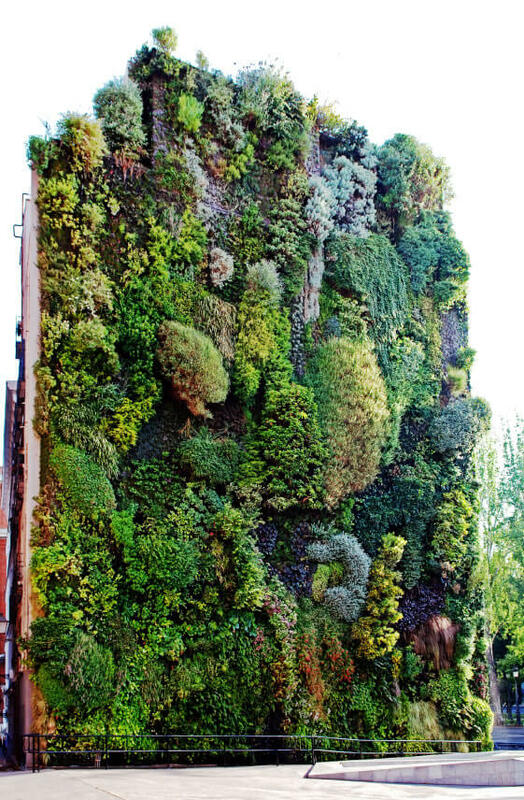 As you will see below, just about any vertical surface can be used to grow plants. 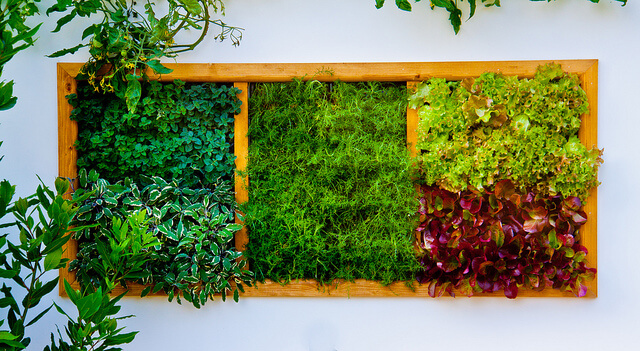 From green walls to repurposed household items, going vertical means getting creative. 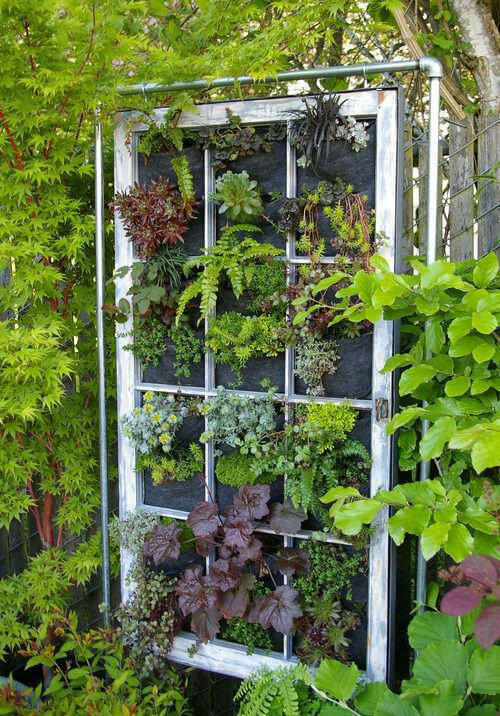 Vertical gardening also is a great way to add a dash of color, a spritz of style, or an overarching design idea to your current gardens. 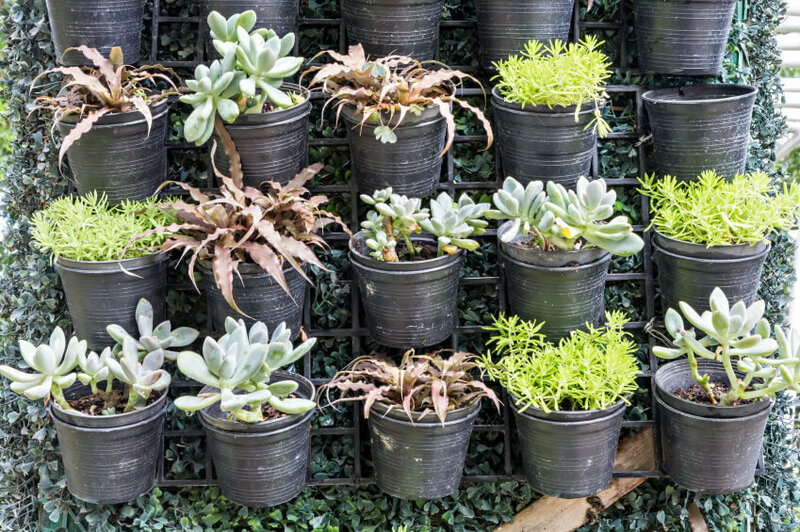 Whether you pack your plants in tightly, focus on growing one particular species, or mix your mediums, your creative impulse is your only limitation. Turn a drab area of fence into a color-soaked collage. Repurpose a window frame to display a variety of colorful flowers. 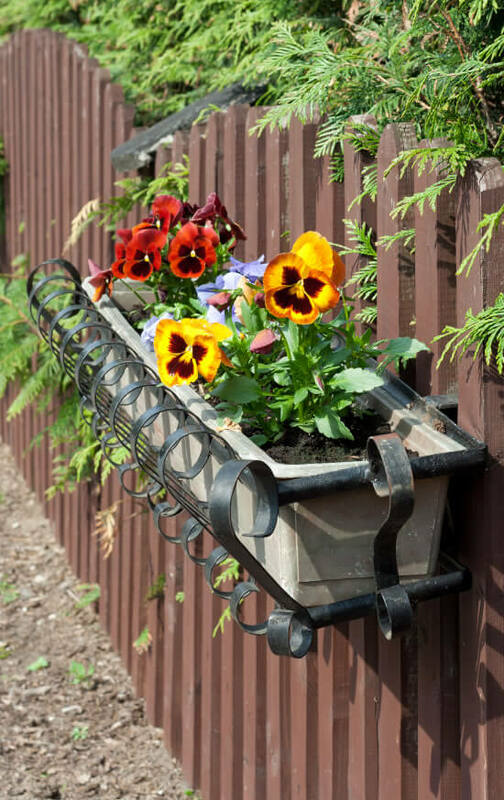 Turn a dull wrought-iron planter into a showpiece hanging along the back fence. 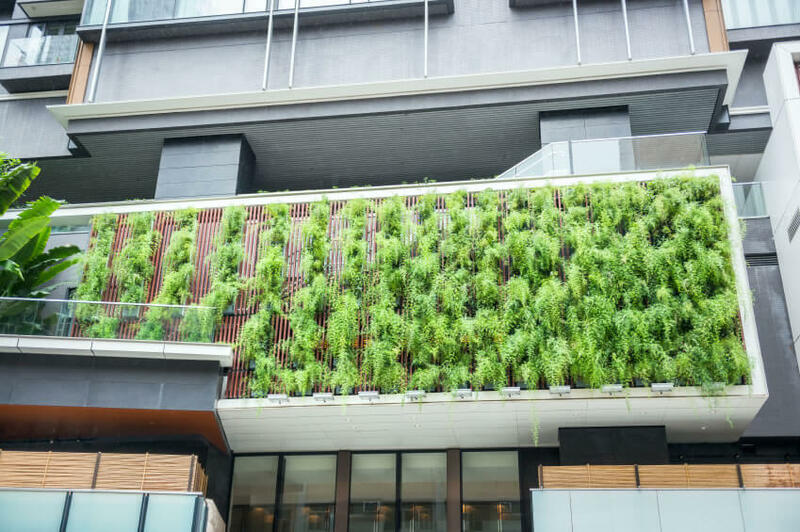 Or turn an outside wall of an average city apartment into a flourishing green wall – which will not only cut down on heating and cooling bills, but also enrich the lives of anyone walking past it. 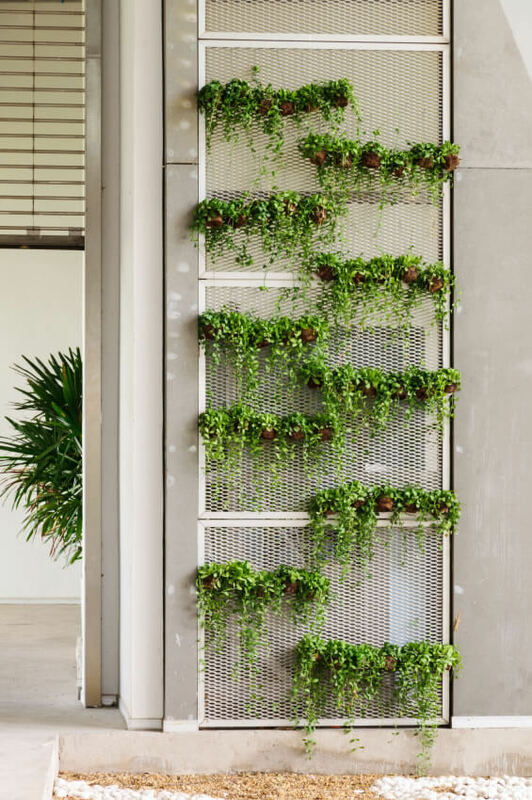 Particularly useful for densely packed urban areas, vertical gardening will keep any city dweller close to the soil that sustains him or her. Try some of the following ideas, or let these ideas stoke some new creations from your very own imagination. 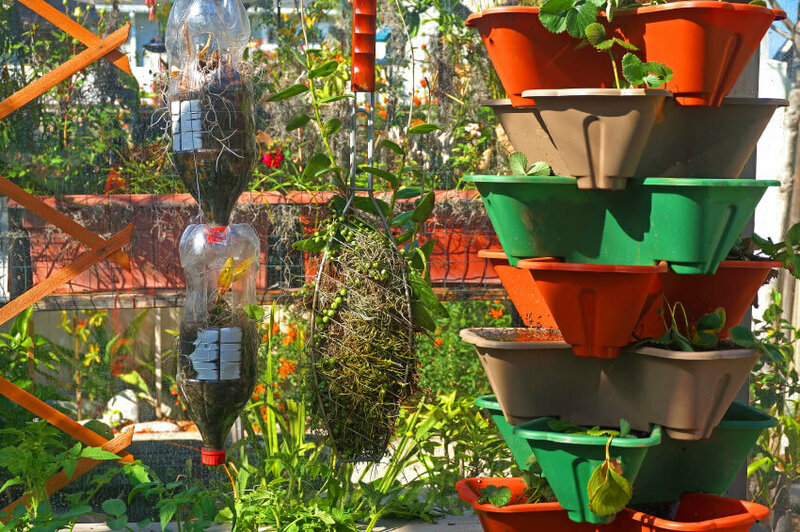 Think growing plants must be done horizontally? Well, be ready to change your mind. 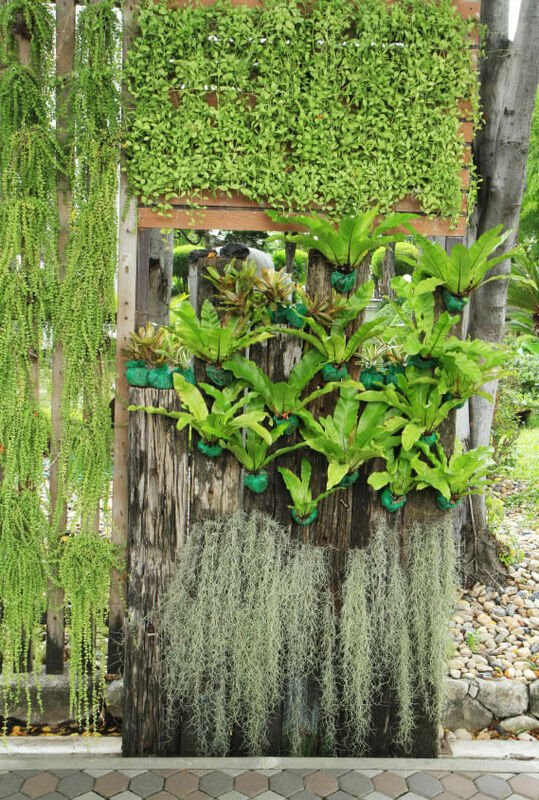 Vertical gardens are perfect space-savers. This garden used carefully spaced brick outcroppings to maximize space and deliver a visually pleasing pattern. 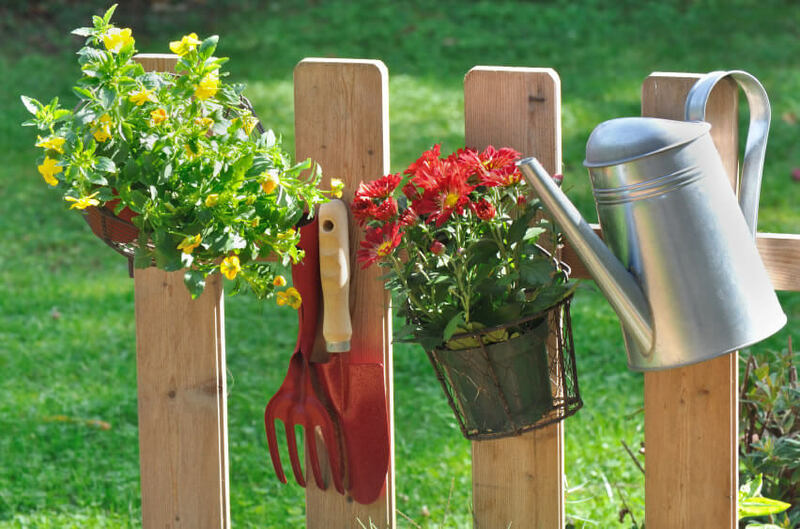 Expanding your garden vertically is as easy as finding flower pots of the same design, painting them a similar color, and then hanging in areas, such as the back fence, usually reserved for empty space. Turning bricks sideways kills two birds with one stone; the bricks can now double as a barrier and as flower pots. Terracing is another cleaver way to increase a garden area. 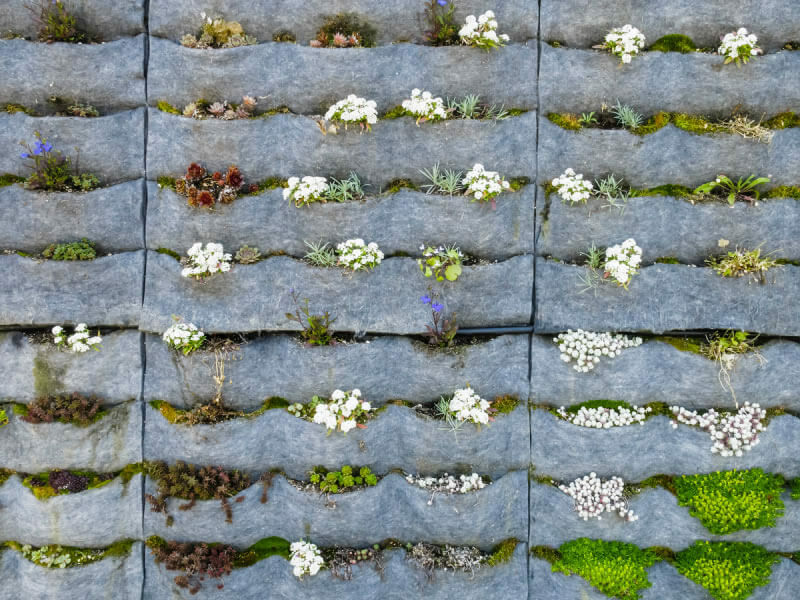 Leaving space in between the bricks allows for plants to jet out of those spaces, providing a crazy quilt of different plant species to make known their presences. 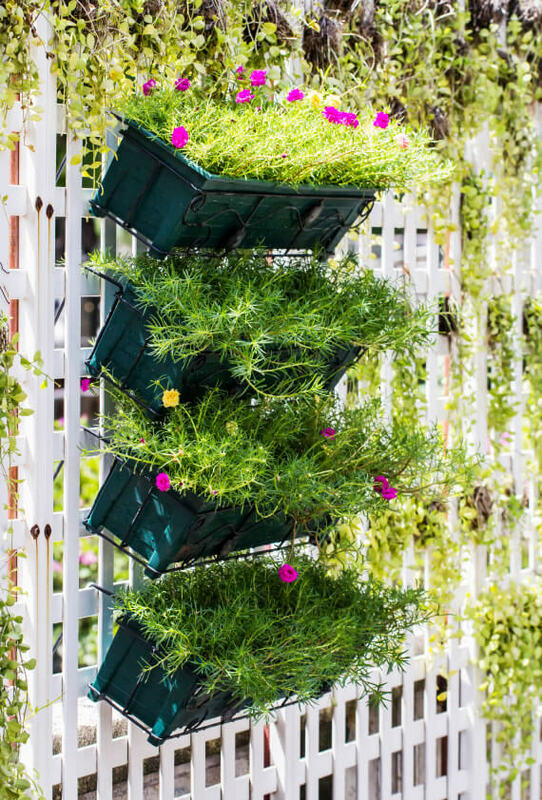 Tiered hanging plant racks is another great way to turned usually unused spaces, such as walls or fences, into usable growing space. As you can see, a lot can be packed into just a small open space. Even the picket fence can get into the act! 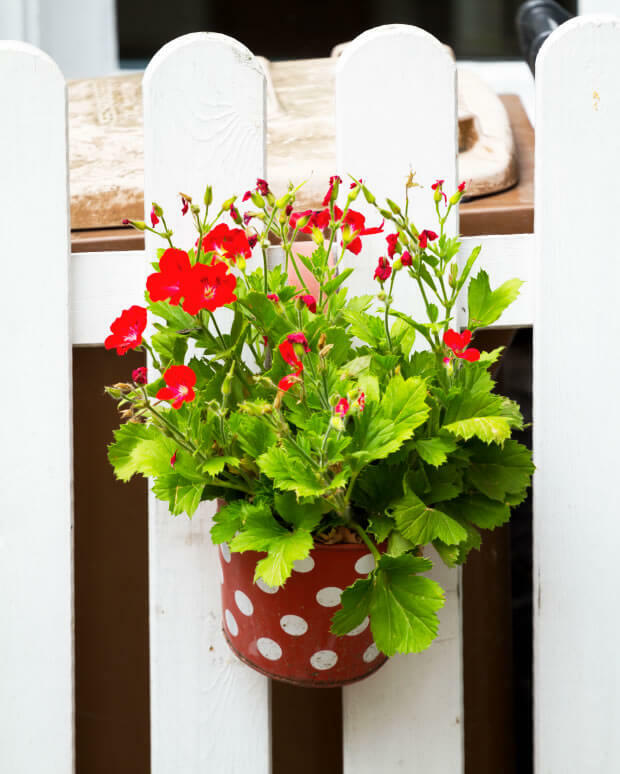 Perfect for hanging smaller items, such as tools and watering cans, a picket fence also is great for hanging small-pot flowers or those plants transitioning from a spot in the ground to a more-vertically inclined gardening area. 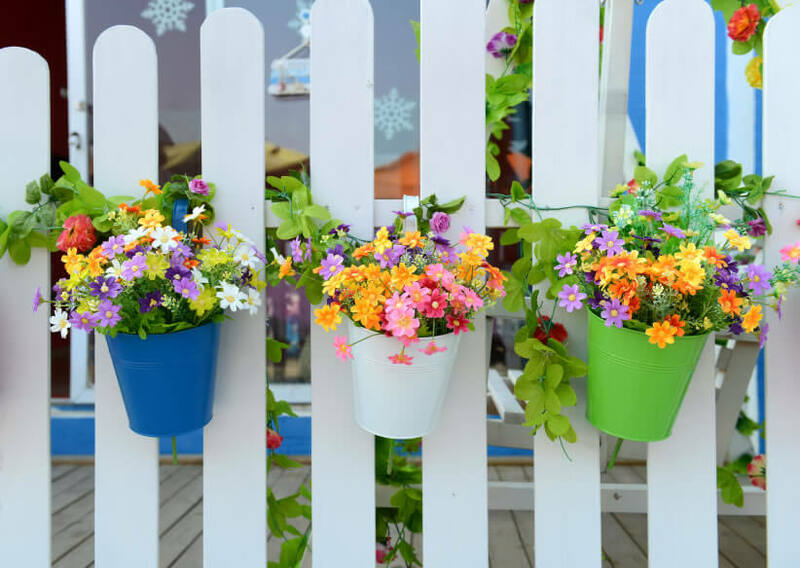 Taking a turn at the traditional white picket fence, splashes of color, in the form of colored pots and batches of flowers, helps turn the placid whiteness into an exciting cornucopia of hues. 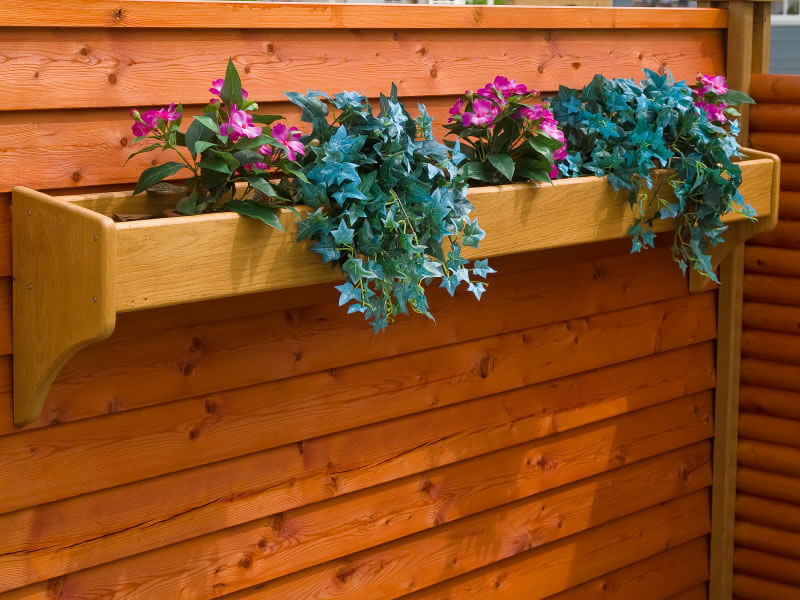 Rather than just hanging flower or plant pots at the tops of fence posts, installing pot brackets below the tops of the fence provides ample room to grow without blocking the tapered posts at the top of a fence. 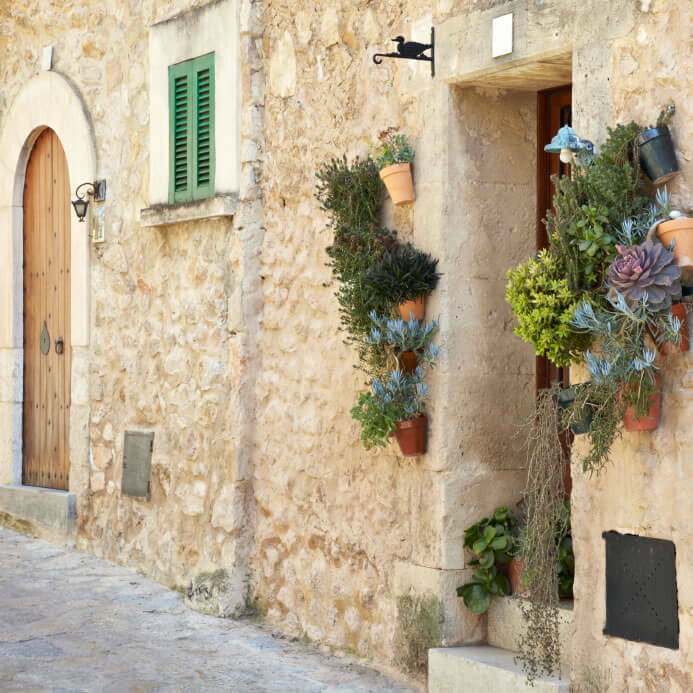 Long a Germanic tradition, hanging flower boxes below windows isn’t limited to The Continent. This method has many advantages, including the fact that budding flowers won’t conceal the world beyond your flower box. Wrought-iron flower pot holders help add a dash of style to the normally mundane business of potting your flowers. Again, adding color to a normally color-neutral areas along fences and walls. A simple, old tin can colorfully painted can go a long way toward spicing up just about any drab area. 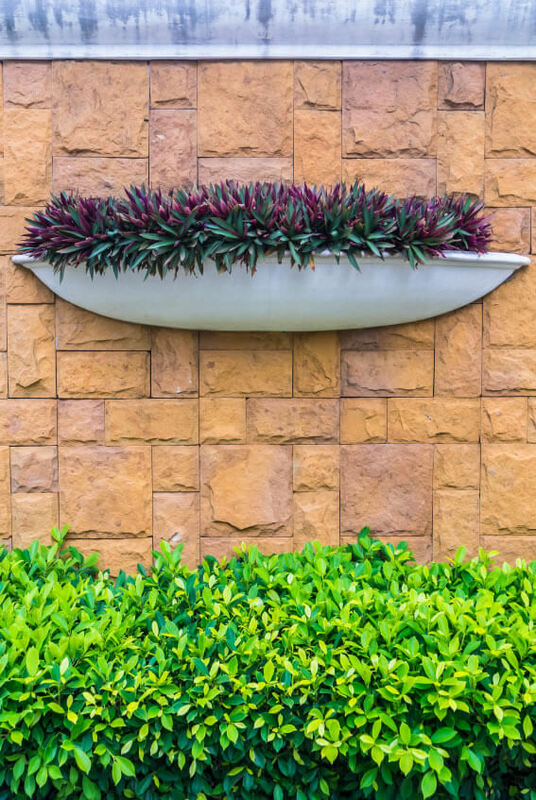 The right combination of flower and flower pot can turn a brick wall into a surprisingly elegant display area. 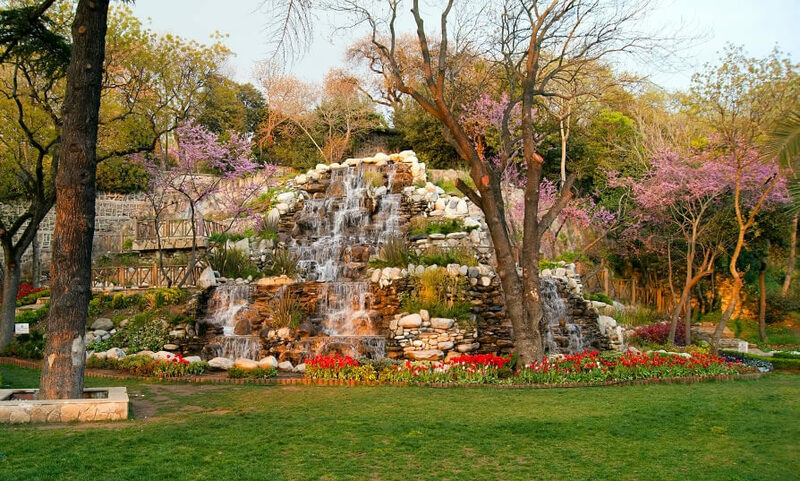 In fact, the wall’s consistent colors do well to set off the color of the flowers. 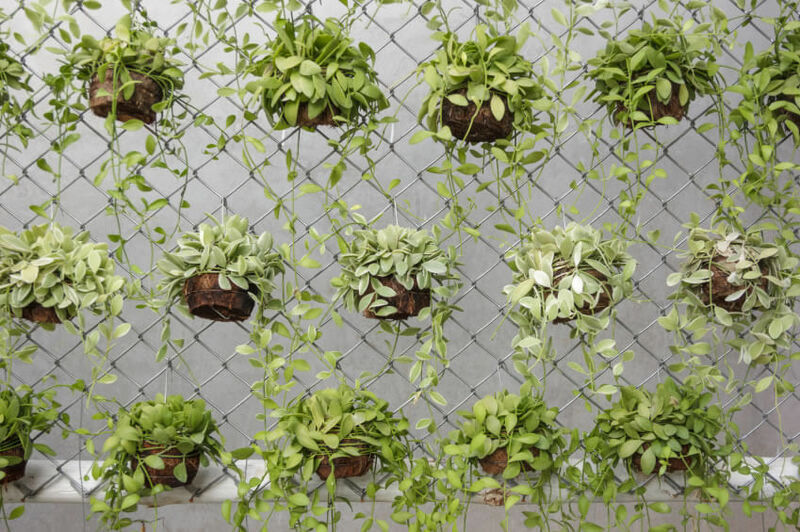 When you have a green thumb, even a chain-link fence can become a flora-inspired work of art. 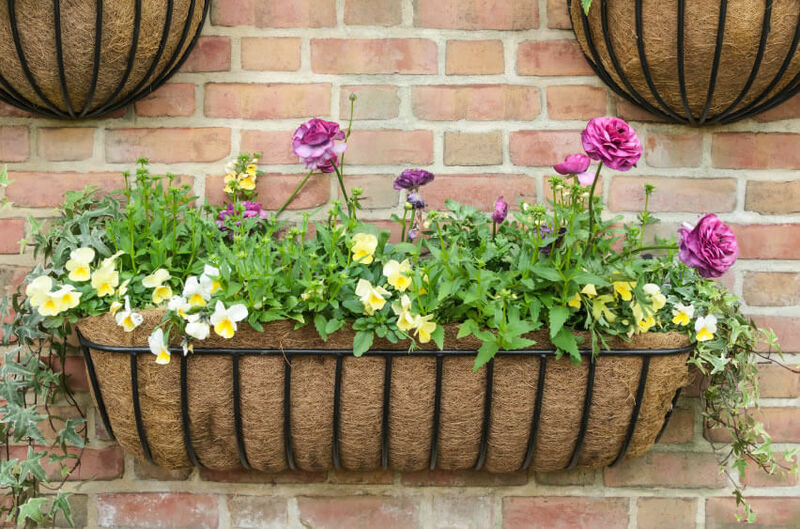 While not often thought of as an art canvas, chain link is perfect for hanging plants and flowers – every link provides another place in which to hang a flower pot! Going vertical is a perfect solution for high-density urban areas or in older, more tightly packed living conditions. 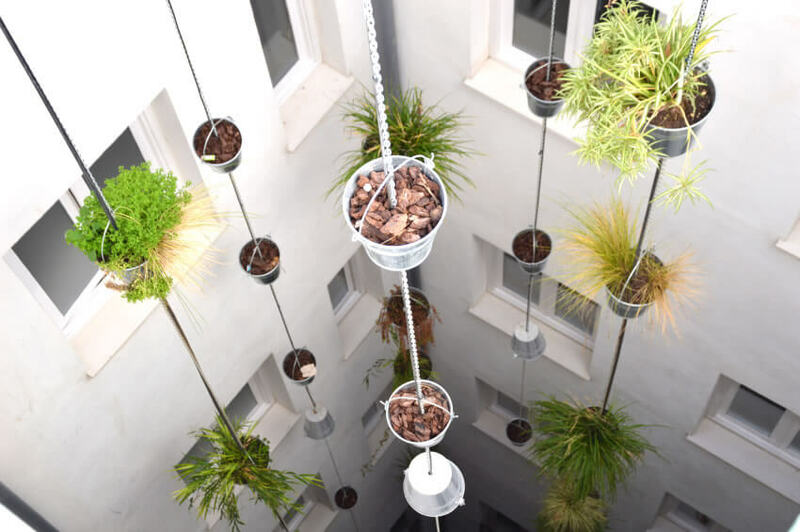 If your space is limited, hanging plant potters down shafts and in atriums makes good use of an area not thought to have much utility. Got some broken terra cotta potters laying around? Go vertical! 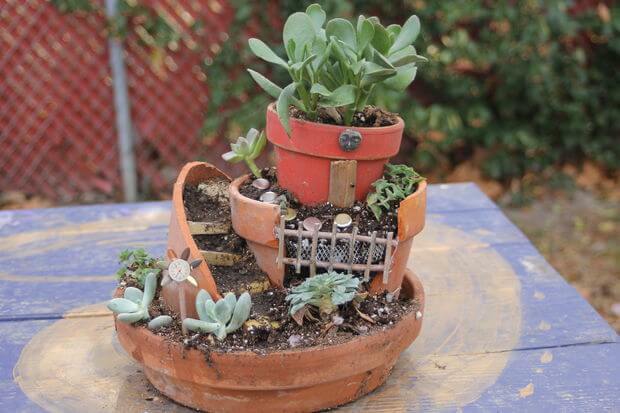 Resting partial pots inside one another allows you to craft a tantalizing tower of succulents. Going vertical means getting creative. Take an old 2-liter soda bottle, cut off the bottom and use it as a potter. With the right undergirding, eventually the rest of two-liter container can come off. Of course, if you’re not feeling very creative, there are stackable flower pots. A tiered rack is the perfect way to go vertical with your flora. Using the above approach, your display will look tidy and organized while, at the same time, save you lots of ground space. Burlap and other porous materials provide a simple and stylish way to display your flowers. On top of being visually pleasing, this method will ensure your flower’s roots are properly drained. 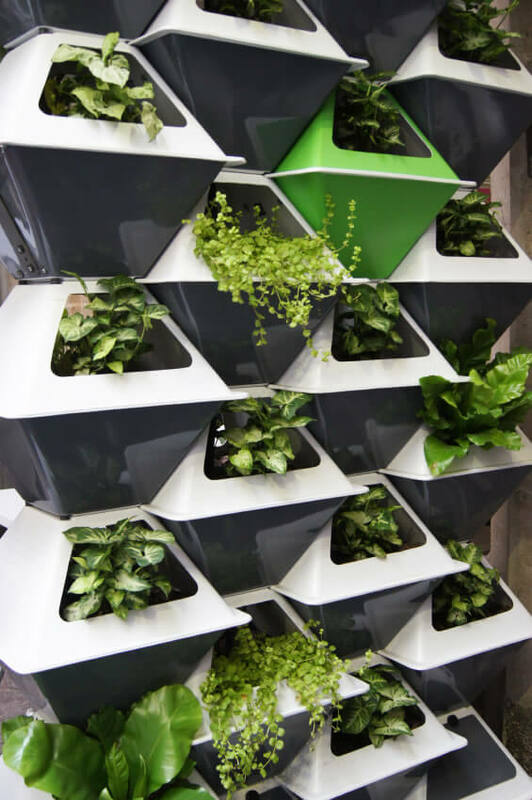 Again, stackable plant pots are an incredible and stylish way to utilize space. Perfect for small apartments, stacking your plants in pod-like pots gives them plenty of room to grow and thrive. 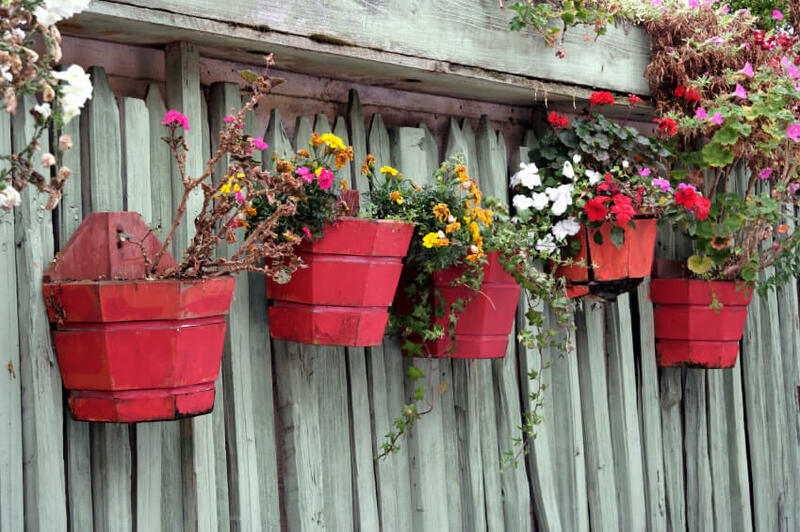 Hanging flower pots from fencing, particularly in areas not typically thought of as fodder for adornment, frees up extra space while sprucing up what may be a boring area. 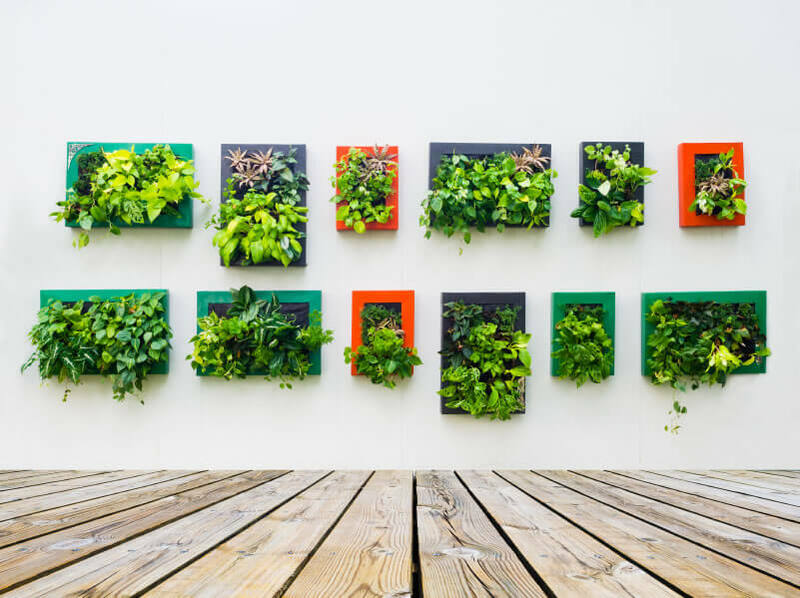 In a case of art imitating life, wall gardens, or green walls, mix stunning aesthetic sensibilities with incredible space utilization. 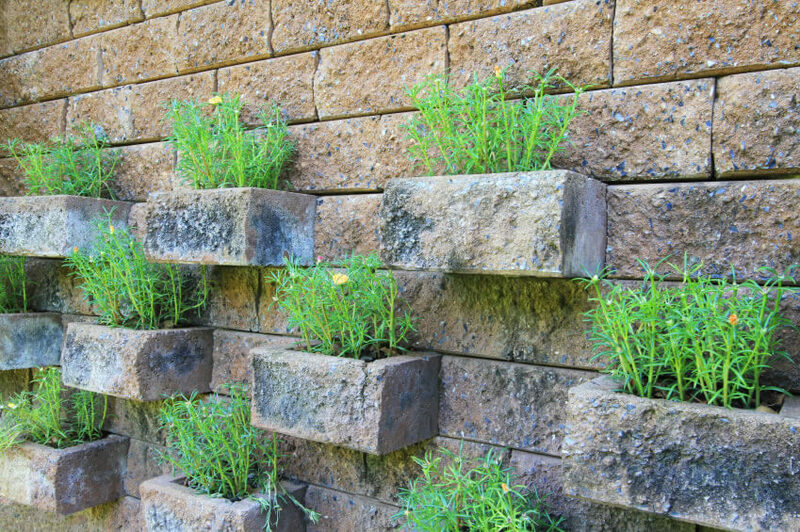 Wall gardens are not limited to solid, flat structures. Breathe new life into those old window frames. Using existing screening, or installing a felt covering, eventually your plants will grow out beyond the window frame. Heavy wall mounts or static flower arrangements can be a thing of the past if you use magnetic flower planters. The ability to move around arrangements allows you to change things up at a moment’s notice! 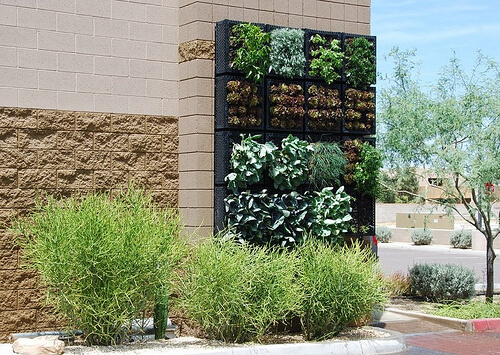 Vertical garden racks are perfect for areas that receive plenty of sun and warm year-round temps. In more northern climes, making the rack detachable allows you to bring them inside once frost becomes a possibility. Make you deck an art gallery! 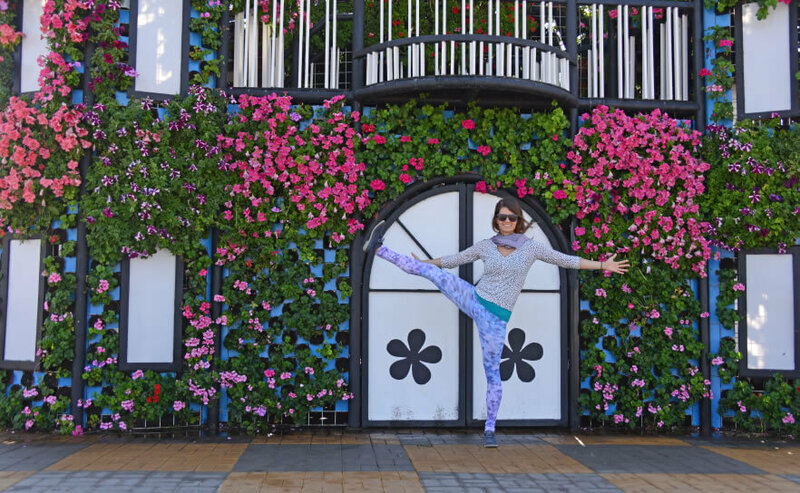 These garden frames puncture the idea that art is in the eye of the beholder, for how could anyone deny these works of art? Grouping the various plant species a pleasing and sharp-looking arrangements will spruce up any tepid deck area. Vegetable gardens no longer are limited to your backyard. And they certainly are not limited to horizontal. This garden is located among a commercial developments, space usually serving just one purpose – parking. One big advantage of this method is that watering from the top tends to trickle the water down onto the plants below, thereby saving water. 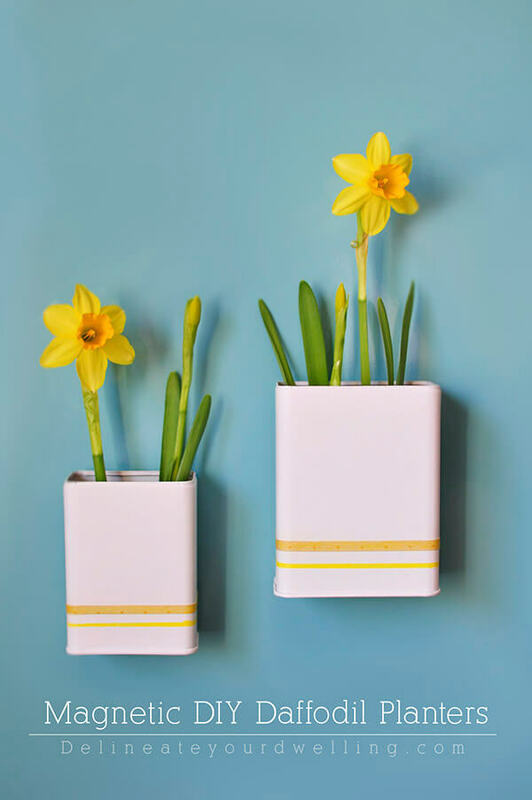 Just in case your love for flowers extend well beyond the reasonable, what is stopping you from covering your entire house with flowering plants? Growing out of pots built into large racks, the above example will make your flowering dreams come true. Never again run out of fresh herbs. 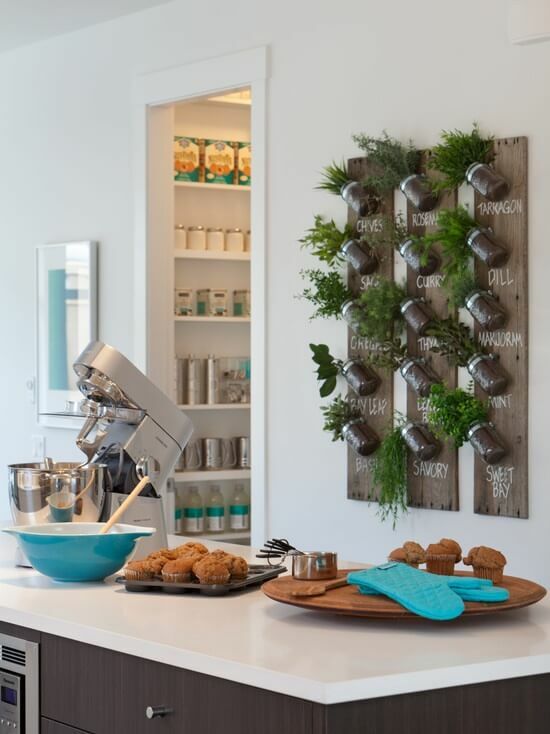 After labeling, this Mason Jar herb garden is affixed to your kitchen wall, allowing you to merely have to reach for one or more herbs to complete the perfect dish. Terracing on small scale, this garden takes advantage of any tight spaces to reach open sky. Sometimes this approach can be used to grow out of natural outcroppings. Other times, they are created by including small crevises as part of a tasteful rock display. 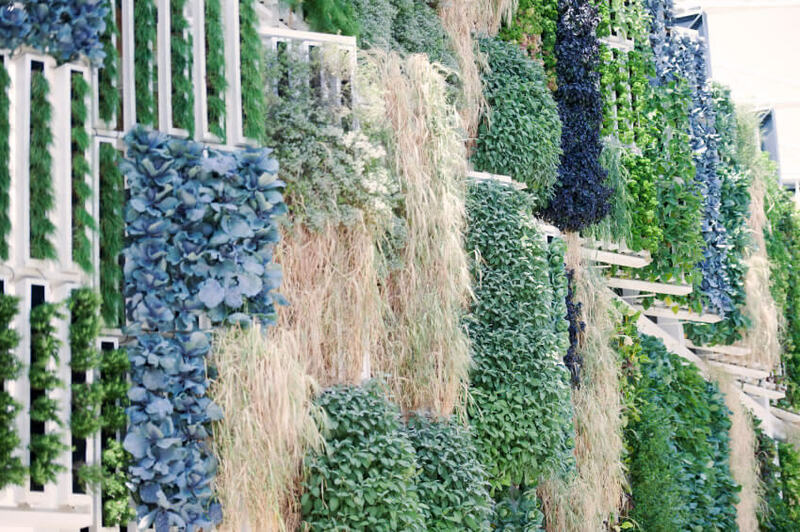 Densely populated urban areas are perfect for vertical gardening. Though placement and watering have to be considered before construction starts, this flower garden uses space that was once neglected. Don’t say wall gardens cannot be diverse. In this example, the wall’s various gardens are sectioned off from the neighboring installation. 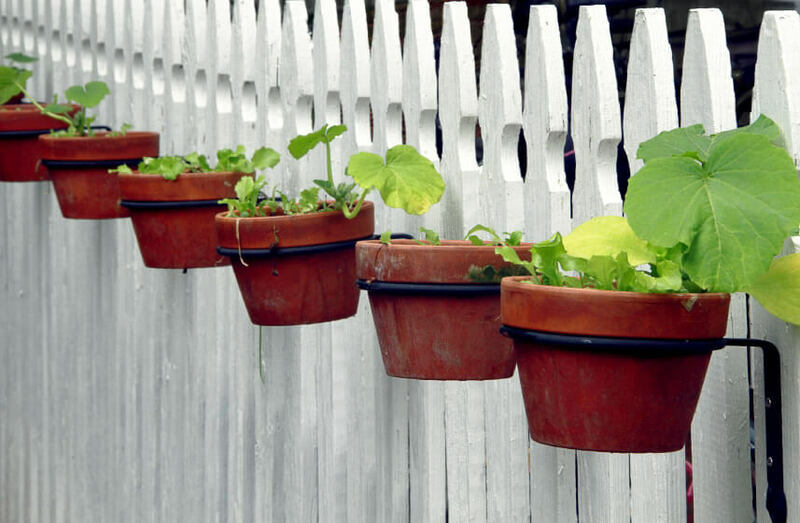 Fencing allows each variety of plant to grow out of a particular growing area. There is vertical…and then there is vertical! Buttress by a specially made surface, this amazing garden grows up the side of the British tenement. 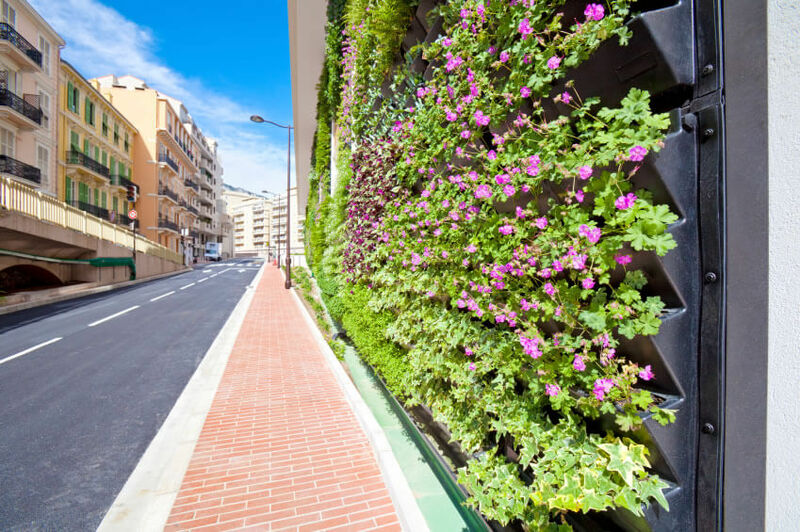 The contrast between ordered urban facades and the wild nature of the wall gardens is striking. 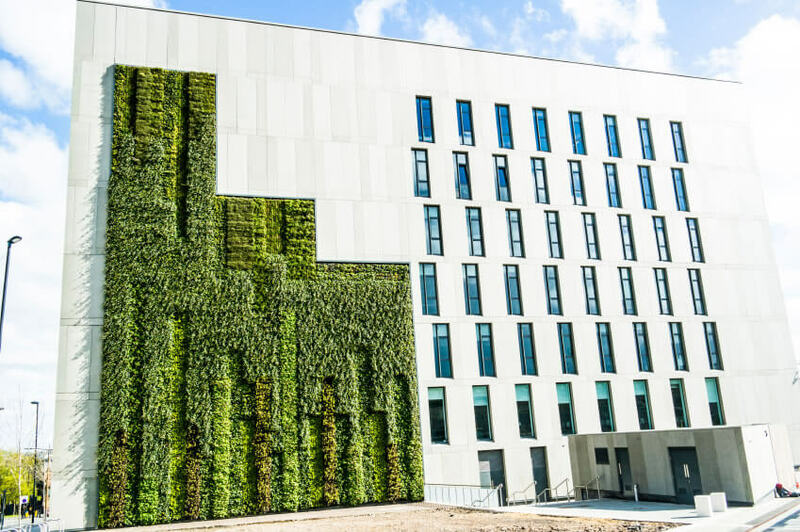 Green walls are more than artistic statements; such installations can cool the building, requiring less heating in the winter and less cooling in the summer, significantly lowering your overall energy use. 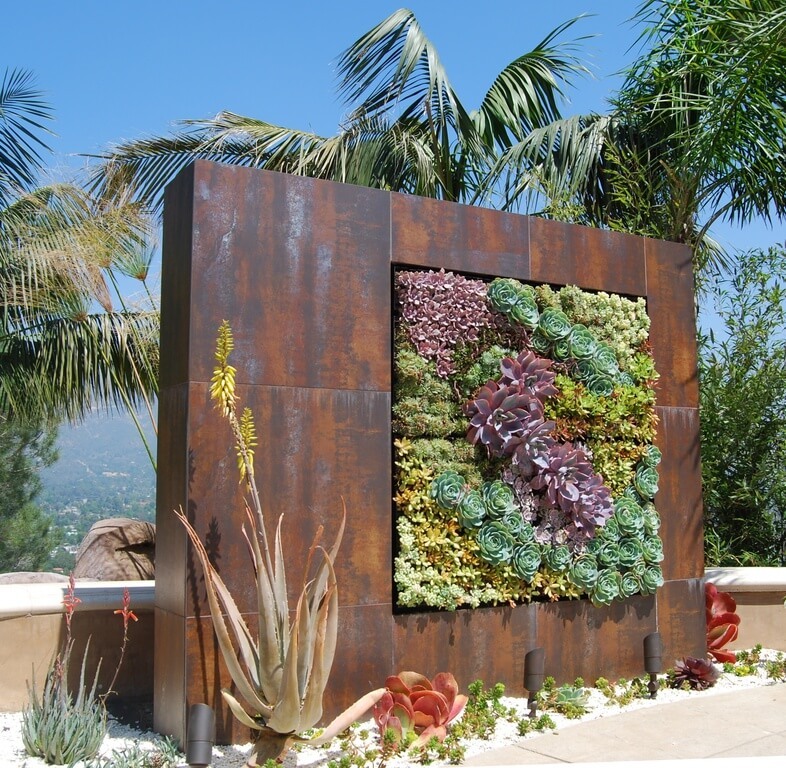 Green walls are a cost-effective way to combine natural beauty with artistic purpose. 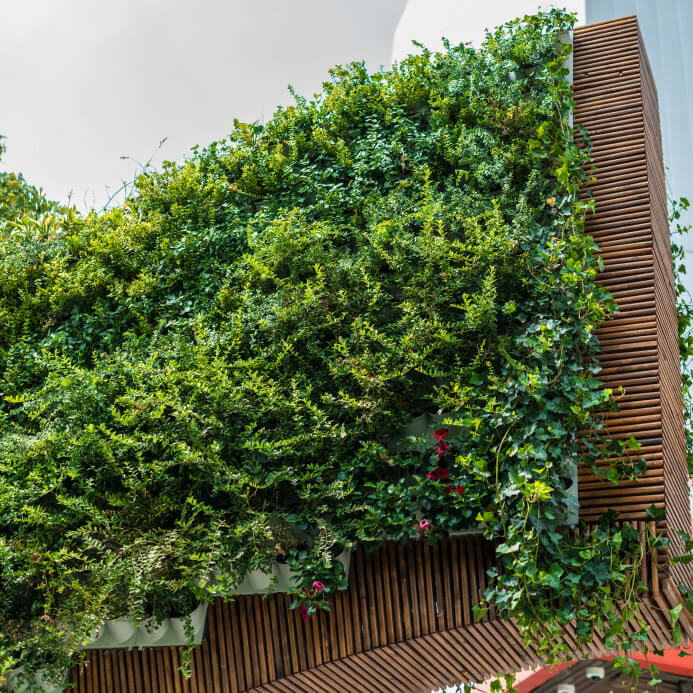 Covering even just small patches of wall with vegetation provides enough cover to help insulate the building from extreme heat or cold. 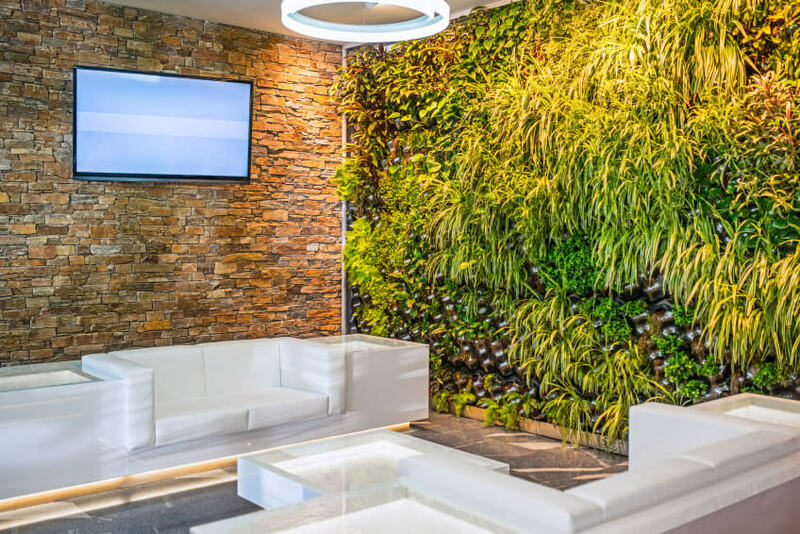 Density is the keyword when it comes green walls, as its carrying capacity only is limited by the surface area of the wall – the more surface area, the more space for your ‘living’ wall. 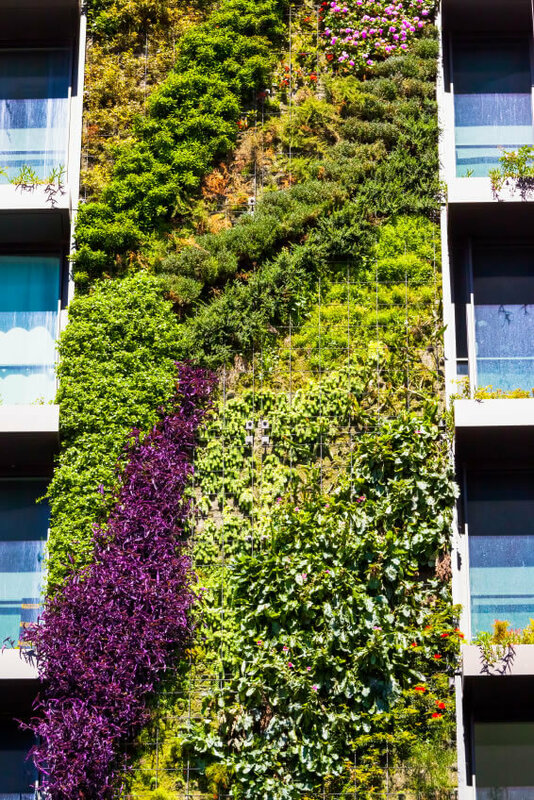 While providing aesthetic beauty and keeping us within eye-shot of the natural world, people often forget that green walls provide habitat for birds and insects – all while helping to purify the outside air. 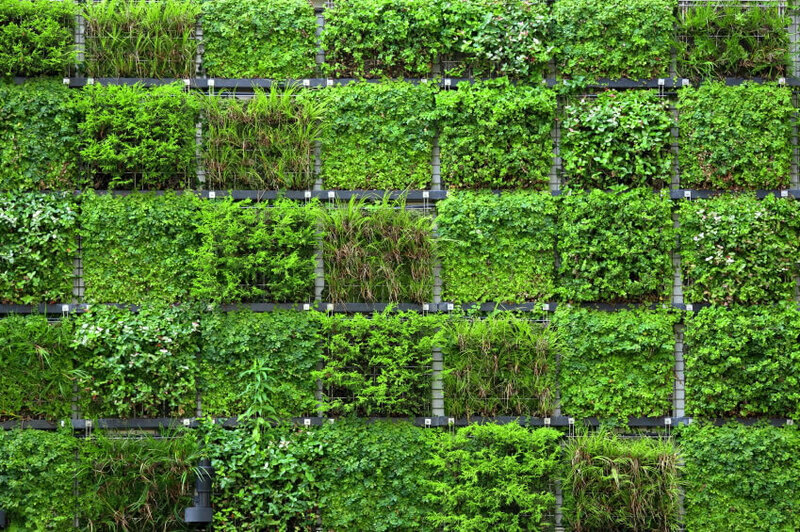 Along with all of the practical benefits of green walls – savings on energy costs, providing animal habitat, et. al. – the beautiful splashes of color and texture that spring forth from the walls. Carefully study and planning of which species and varieties to use can provide year-round color. Go with a collage of colors or stick to one species – as long as the species you pick can handle the local weather, the only limitation is your artistic vision. The above ferns are great at providing shade and relaxing the people whom encounter it without overwhelming the host structure. 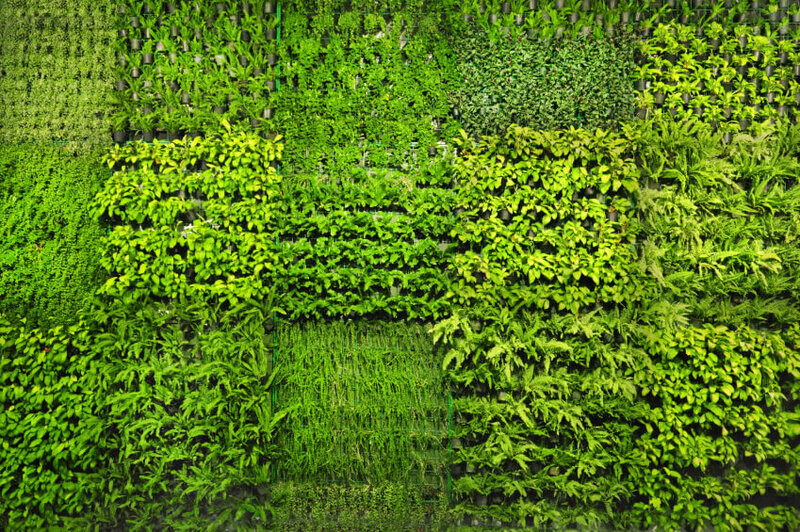 The green wall idea was first proposed in 1938 by Professor Stanley Hart White of the University of Illinois Urbana-Champaign. Then termed a ‘Vegetative-Bearing Architectonic Structure and System’, White conceived of buildings engulfed with vegetation, similar to many of the buildings presented here Unfortunately, White died before he could see his idea come into full bloom. 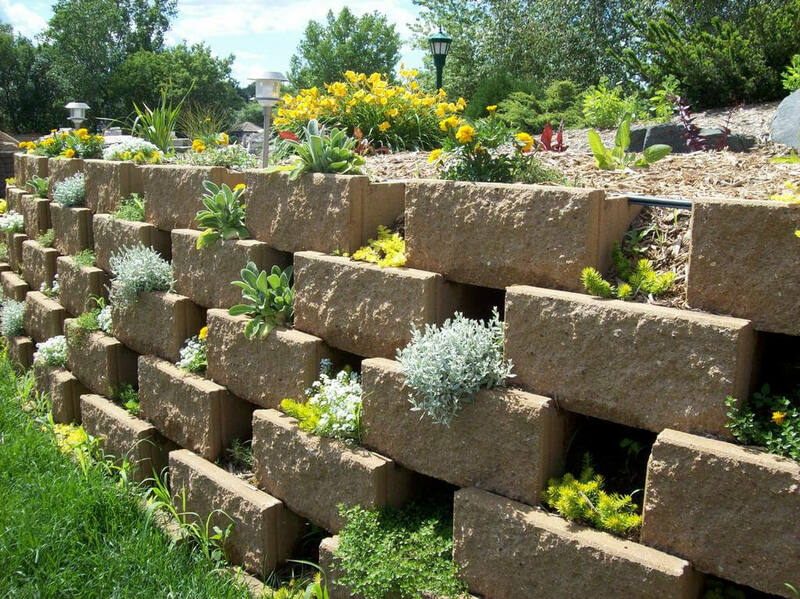 Even small garden wall installations can be effective. 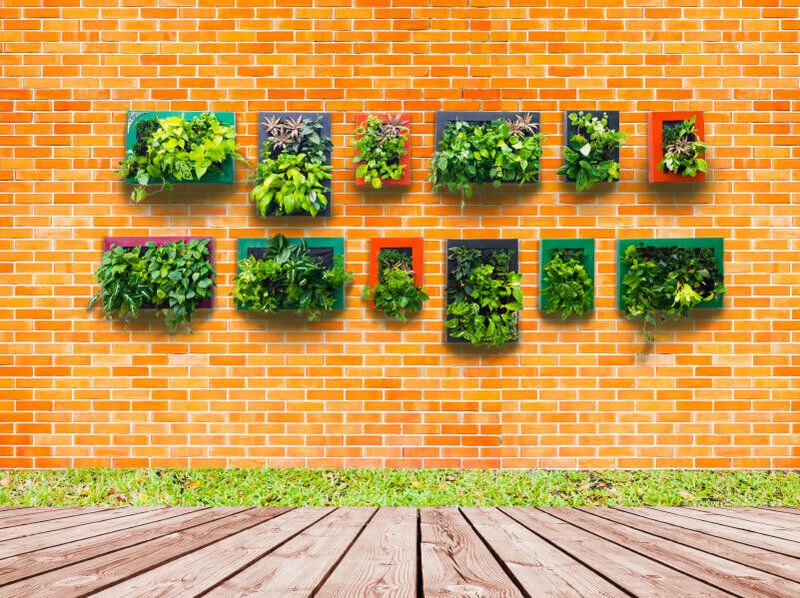 The one above uses frames from which to grow the plants, painting the frames a variety of colors to highlight each display. Why stop with the walls? As the above dining room chair attests, just about anything – the mundane and exotic alike – can be used as a vegetable and flower planter. Got a hanging object you would like to spruce up? 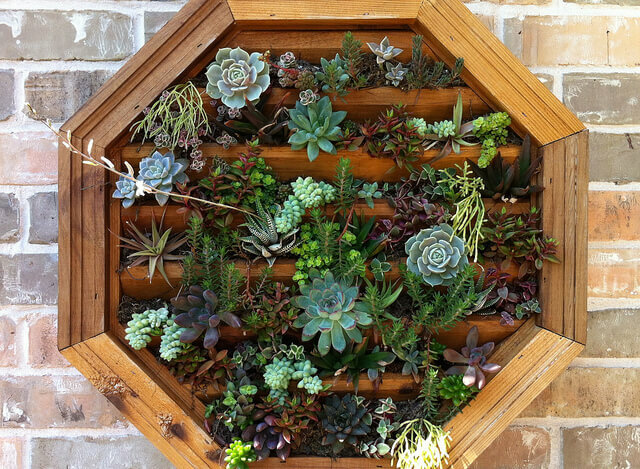 These succulents intriguingly burst forth from a wooden frame vent that was a thrift store find. Rock structures are a perfect medium for many plant species. Growing up through the gaps between each rock, plants can provide cover, color, and help break up the solid rock lines of the formation. 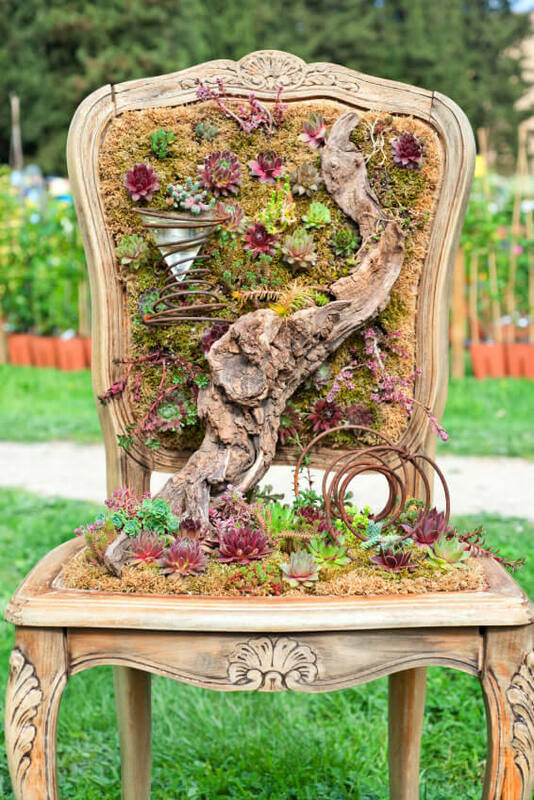 Mixing wood mediums helps turn a boring old stump into an exciting plant display. Using a variety of plant species will give viewers plenty of interesting colors and shapes at which to muse. 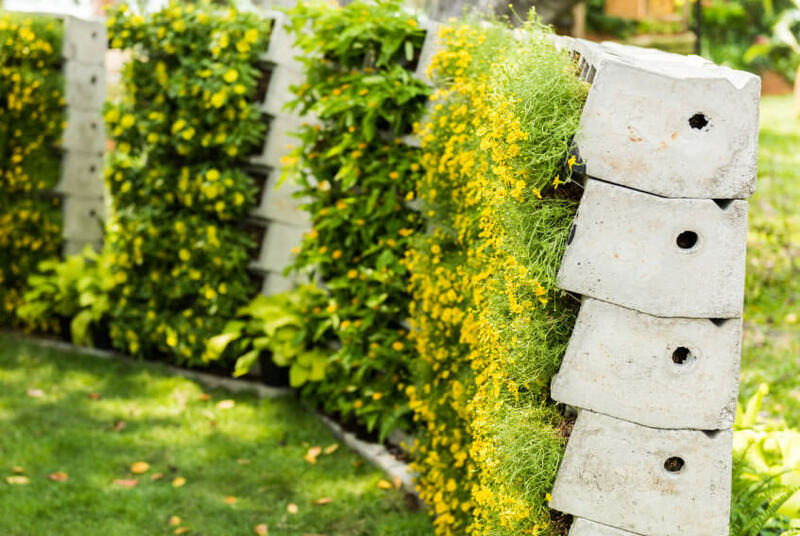 Vertical plants, like those in the above garden boxes, make excellent use of space while providing a blast of color and style. 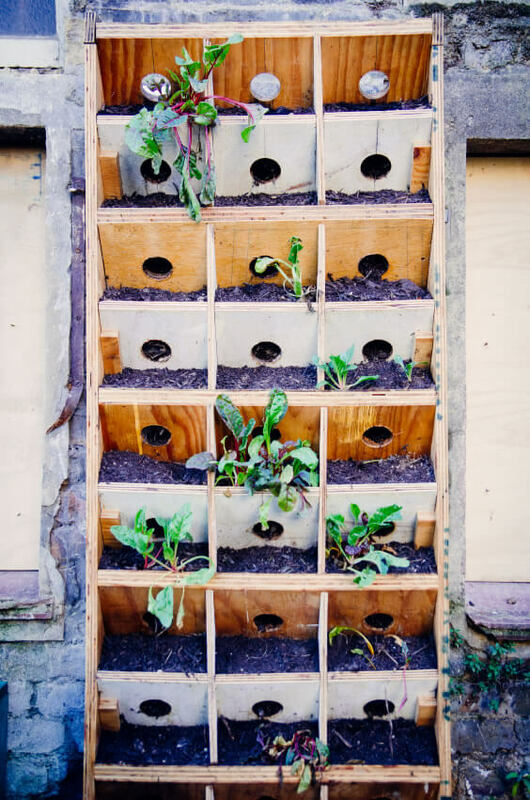 Repurposed wooden displays are great for growing one or more types of vegetables. The above sprouting beets turn what could have been a neglected installation into a useful grow space. With the ubiquity of rotting wooden picture frames lying around, you should have no trouble finding the perfect one for your next planter. 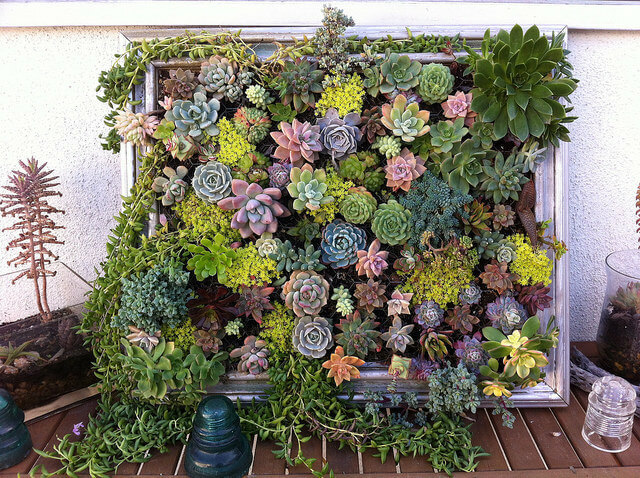 Mixing these colorful succulents with the old, battered frame helps bring out the beauty in both!